I am Anna Shaw and I recently attended a Tech Salon that really got me thinking. We spent a morning discussing, What Are the Technology Challenges in Congo Brazzaville? Then, Vérone Mankou spoke up. And everyone else got really quiet. While ‘tablet computers’ were still a thing of the future, Vérone thought through and designed a device that would later become the VMKtech Way-C. But he couldn’t get the capital to start production, until Steve Jobs announced the iPad. Then everything changed and his efforts were noticed and supported. Building an initial batch of 1,000 tablets to test the market, he expected to sell them over three months. Instead he sold those first 1,000 tablets a week after they were launched. 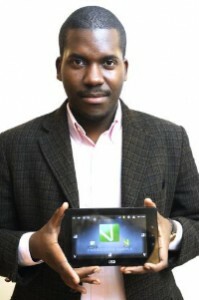 Since then he has developed the Elikia smartphone and a lower-cost tablet designed for educational programs. These homegrown technologies help overcome the price problems facing ICT4D in developing countries. Based in Vérone’s home of Congo-Brazzaville, these phones and tablets are far less expensive than their Western-designed counterparts. While iPads in Congo can go for more than $1000USD, a Way-C tablet is anywhere between $200-$300, putting these devices in closer reach to the everyday African. Yet, the devices are not “cheap” even though they are low cost. In his position, Vérone has seen a unique side to the ICT4D story, and faces a subtly different set of challenges from NGO and other development actors trying to use technology in Africa. Funding: Vérone managed to finance his venture through his own business acumen and grants from the government. Finding other investors was a struggle at first. Congo-Brazzaville doesn’t have a culture of venture capitalism, nor the institutions to properly support it. Investors didn’t understand the value or purpose of a tablet computer, and investing in “Congo” seems like a bad idea. You know, with its ongoing instability – oh wait, wrong Congo. Technological Ecosystem: Hardware is hardware. Processing chips and screens are all the same to a certain extent. The more important factor is the balance between the hardware, the software, the interface, and other systems around the device. For example, iPhones rely on the App Store, but in many places in Africa, the App store just isn’t an option – buying software online isn’t a norm. A system for developers has to be developed to disseminate and sell their programs. Software also must meet the needs and capacity of the end users. Things that are fancy are not always the best. Vérone hadn’t used his phone’s GPS until arriving in the states because there are no good maps to make GPS useful when he travels around Africa. Electricity: People in the United States want a battery in their phone that lasts all day. In Africa, many people need it to last a month or more. Battery life is one of the biggest challenges in technology today, not just ICT4D. Especially for schools and other social uses, this means pairing up with government to find solutions. “Made in Africa”: While the NGO community thinks the label “Made in Africa” on any tech product is incredible, consumers don’t seem to feel the same way. Being made in Africa is often a warning of poor quality – something Vérone had to overcome by exhibiting the high standards he uses for his products. Transportation Costs and Distribution: Shipping a tablet from Hong Kong to Africa costs about a third as much as shipping it between African countries, which makes centralizing this operation more difficult. VMK als relies on third parties to sell their products at the moment. To make an extra bit of money, these third parties might add on a few extra dollars to the price, reducing VMK’s advantage. But even to this Vérone has a solution. In the next year, he has designs on opening VMK stores – allowing him to sell directly to consumers, following yet again in Steve Jobs’ shoes. Vérone is a shining example to other young Africans – and people generally. He has more business sense, technological insight, common sense and drive than most. He sees these challenges, but finds solutions – working with governments, NGOs, and other talented individuals to build and grow the first truly African tablet and smartphone. The development community would be served well to learn from him, and find others like him who are driven to improve themselves and their countries and not let anything stand in their way. Looking at the challenges he faced is a useful measure to the roadblocks other young leaders will face in the developing world – and his success is a small taste of hope for a changing world. On May 28th, Vérone will be speaking at the Tech Salon in San Francisco – don’t miss your chance to hear his story yourself. To prepare, read a bit more about him here.